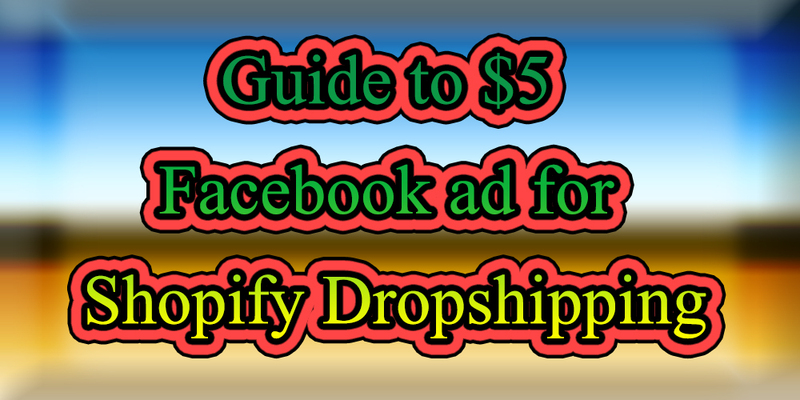 There is a very common question that comes to the mind of every Dropshipper is that “Does $5 Facebook ad still work for Shopify Dropshipping?” The answer is definitely a “Yes”. However, in order to utilize that $5 ad for Shopify Dropshipping, you must keep many other things in mind. This article will tell you how to utilize $5 Facebook ad to bring your Dropshipping business on the verge of success. Does $5 Facebook ad for Shopify Dropshipping really work? The question whether $5 Facebook ad can still work for Shopify Dropshipping is very common. We get to hear this question on a daily basis. The reliability of $5 Facebook ad was not questioned a few years back. However, with the increasing development of advertising media and modes of business, people tend to rely less on $5 Facebook ad. A few years back, there was so much that you could do with $5 Facebook ad. You could do wonders to your Shopify Dropshipping through it. A few years ago, the competition Facebook ads were relatively less than it is today. People were dependent less on Facebook ads for the promotion of their business. There were not many Dropshipping companies which used $5 Facebook ads for their business. Facebook used to optimize that $5 ad well enough. But the scenario has somewhat changed now. You need more money than $5 for typical purchase conversions or a add to cart. The situation is kind of problematic now as $5 is not enough money to work for a period of whole 24 hours. Facebook has changed the way it optimizes $5 for Facebook ads. The way Facebook uses that $5 is a lot different now. $5 is not enough to stretch your ad for whole 24 hours. Imagine your ad displaying in a region at 4 a.m. in the morning. No one is going to click on your ad as that is the time when people usually sleep. The other case is Facebook doesn’t have enough skin to recognize geographical factors and time to optimize $5 for Facebook ads. Facebook is not providing full 24-hour testing and you might lose customers who could buy your products say 8’o clock in the morning or 10’o clock in the night. So, what you need is to get Facebook optimize your ads in the best possible way. In this article, we will tell you the ways in which you can still use that $5 Facebook ad for typical purchase conversions. The first thing that you need to keep in mind is that $5 Facebook ads work great for PPE ads. If you are dealing with engagement ads, you don’t need more than $5. Also, you just need a period of one or two days to work on your ads. If you deal with ads, you must take a step ahead and boost social proof or anything that you are doing. Five dollars is enough to perform such tasks. Also, five dollars is enough for ads for one day. It will provide a Social Proof. It will give an adequate push to your ads on Facebook and Instagram. This is done by considering the fact that which product will do good on Instagram and which ad will be better for Facebook. The initial intelligence decides whether to push that ad on Facebook or Instagram. You should always consider a very important point that the 80 percent budget of some ads might go towards Instagram while other 20 percent go towards Facebook or vice versa. Or budget might be spent 90 percent on Facebook and 10 percent on Instagram. This happens because ads of certain products do well on Instagram and ads of other products do well on Facebook. We suggest to Keep Facebook and Instagram together instead of keeping them apart because of the incredible intelligence of your pixel. The initial intelligence already decides that which platform is better for a certain product and optimizes the budget accordingly. Providing a $5 PPE ad enables the initial intelligence to know whether the ad should be pushed more towards Instagram or Facebook. However, one thing that you need to keep in mind is that with a $5-dollar PPE ad you will get amazing social proof and you can know whether your product has a potential or not. In case you get a cost of 20 cents per engagement instead of 1 cent, it’s not a good sign. So, by following the above way you can use $5 Facebook ad in your Dropshipping Business. You can use $5 Facebook Ads for Duplicating. This duplicating works best when you have a look a like audience. The first thing that you need to do is to do a good research on the audience that you are targeting. If you have look a like audience, go ahead and duplicate that a few times. For example, if you are testing a 1 to 5 percent or even 1 to 10 percent, you should duplicate approximately 3 to 5 times with 5 dollars each time. The next thing that you need to do is to choose the winners after 2 to 4 days. You might have 3 out of the 5 products at least in case you have decent products. The last thing that you need to do is to Scale them up vertically. This is one of the coolest ways to scale a little bit horizontally by using $5 Facebook ads and look like audience. It is to be noted that you must focus on the geography of the audience that you are targeting. Build enough data and try to target the similar kind of audience. For example, if you are choosing the United States. Choose a decent winning product and make a look like audience. We suggest you do 1 to 10 percent or 1 to 5 percent. Take that 1 to 10 percent and duplicate it a few times at 5 dollars a day and scale up the winners. There are also other ways in which you can use $5 Facebook ads and look a like audience many times. You can test multiple percentages like 1 to 7 percent or 1 to 2 percent or whatsoever and duplicate them multiple times with 5 dollars a day. However, this way is little expensive as you are doing it for one country. Whereas you can easily do 50 dollars or more per day but if you have a winning product, you are definitely gaining you money back through your Dropshipping business. In order to grow your Dropshipping business with $5 Facebook ads, you must understand the importance of spending more than five dollars a day for typical conversions ads. As we have already discussed above that five dollars a day is not enough for testing products with the conversion. For example, if you start with the five dollars PPE ad, you must move to conversions of ten dollars a day as ten dollars a day is an adequate amount of money that you need to spend on your ads so that they can be pushed for a period of 24 hours. Even if you are testing your products in any country outside the United States, ten dollars is enough to push your ads throughout the day. The only time that you should use a $5 Facebook ad is when you are testing a very small country in terms of population or geography. $10 conversions ads work so much better than the $5 conversions ads. However, if you are targeting a small country then $5 is enough to spread through that population. We recommend all the Dropshippers out there to use $10 to $20 a day. We highly suggest you not to ever test a brand or a product with more than $20 that is new and you don’t know if it’s decent or not. More than $20 is too much for any Facebook ad. Even if you have a big budget, you must start testing your products with 10$ a day and not more than that. You can test your products in a lot of countries instead. Instead of testing 4 to 5 ads at $20 a day you can start with 10 to 20 ads at $10 a day at the same time in ten to twenty countries. This is because some products work for some countries and other products work for other countries. So, this was all about $5 Facebook ads for Shopify Dropshipping. In case you want to add some comments or have any queries regarding $5 Facebook ads for Dropshipping business, you can leave comments down here. We are here to help you.